Optimized cooking by uniform heat conduction in skirt and base. The angle at the base and area around the handle are designed for easy cleaning. TOP FEATURES: 1. Special stainless steel body. 2. Sandwich aluminum base bottom with shape memory. 3. 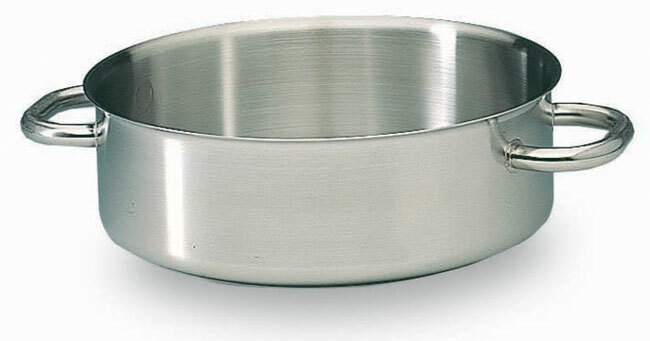 Base covered with metallic stainless steel disk for induction. 4. Reinforced edge 5. Handles are insulated stainless steel tube and “stay cool” to prevent heat diffusing. 6. French standard NF and US NSF Approved. 11”, 3 1/2”, 5 3/4. 12 1/2”, 4”, 8 1/2. 14 1/8”, 4 3/4”, 12 3/4. 17 3/4”, 5 7/8”, 24. 19 3/4”, 6 1/2”, 34.